Sheffield has been described as a city split in two – with rich and poor areas divided by an invisible Berlin Wall. Sheffield is divided in two by an invisible Berlin Wall, a report has said. The study for New Statesman spin-off website CityMetric dubs Sheffield as being split distinctly into two – Sheffield A and Sheffield B. Writer Sam Gregory said: “When media types talk about Sheffield as a hyper-creative, culturally left-field ‘Bristol of the North’ (or a Leipzig of the West), they’re talking about Sheffield A and not Sheffield B. 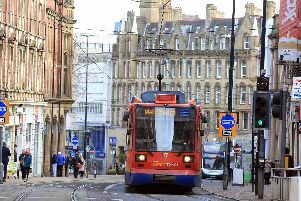 “Sheffield A is a healthy, wealthy and leafy mix of greens, golf courses and gastropubs stretching from Fulwood and Ranmoor in the west to Nether Edge, Meersbrook and Dore in the south. The piece adds that the poorer side of the city is centred around steel mills, factories and workers’ housing while the more affluent side of Sheffield is centred around the hilly parts that border the Peak District. And Gregory says that across the city, children can have a life expectancy that can be up to as much as ten years between rich and poor. The report adds: “The average life expectancy falls by 7.5 years for men and almost 10 years for women along a bus route that runs from Ecclesfield in the north to Ecclesall in the south, right across the divide. “A baby girl born and who lives her life in one part of the city can expect to live, on average, almost 10 years longer than a similar baby girl born and living her life about four miles away, by virtue of nothing more than the socio-economic circumstances and area she was born into”. It adds: “The richer half of the city don’t even see their poorer fellow citizens, as they would in London or Manchester, where disadvantaged areas like Tower Hamlets and Southwark rub shoulders with the moneyed comfort of Islington and Greenwich. Constructed in 1961, the Berlin Wall physically and ideologically separated the German city until being torn down in 1989. The heavily guarded wall saw West Berlin encircled as a Western enclave in East Germany before reunification of East and West Germany took place in 1990.